Libraries play an integral role in welcoming refugees to their new communities. 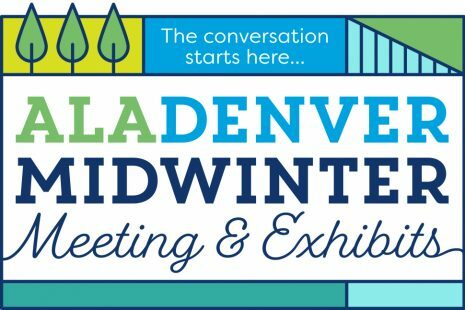 That was the crux of Project Welcome: Refugee Resettlement Agencies and Libraries, a Center for the Future of Libraries program at the 2018 Midwinter Meeting & Exhibits in Denver February 10. Moderated by Clara M. Chu, director of the Mortenson Center for International Library Programs at the University of Illinois at Urbana-Champaign, the panel discussion featured individuals from libraries, non-profits, and government agencies who detailed efforts to make the resettlement process as easy as possible for their refugee communities. “Libraries carve out a special place for refugees in our community,” said Joseph Wismann-Horther, integration partnership supervisor for Colorado Refugee Services Program. He said there has been a mischaracterization of refugees in the US in the media and by elected officials since the 2016 election. Libraries can help combat these falsehoods, he noted. Wismann-Horther began with stats and trends about the current state of resettlement and refugees both in the US and abroad. The numbers were staggering: 65.6 million people, more than half of whom are under age 18, have been forcibly displaced from their homes worldwide. Reaching these communities and helping them feel welcome in their new homes, especially the children, is where libraries can take the lead by being a safe space and by offering services that aid in integration and learning, he said. Jamie C. Torres, deputy director of the Mayor’s Agency for Human Rights and Community Partnerships and the director of the Office of Immigrant and Refugee Affairs for the City of Denver, echoed Wisemann-Horther’s sentiments and explained her agencies’ work to help refugees ease into their communities. 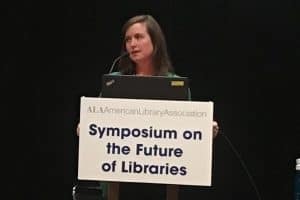 Torres said that most of her work is in policy and legislation, but she also works extensively with Denver Public Library (DPL) to help librarians understand further the communities they serve, from mapping the myriad of languages spoken in different neighborhoods throughout the city to hosting welcoming programs and advocacy-themed weeks. She also encouraged library staffers to become involved in city government to gain further knowledge and to have a stronger voice. 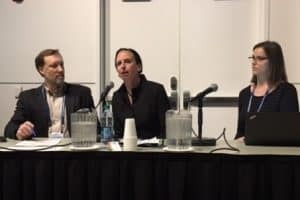 “There are a lot of creative ways to figure out what space we fill and how we can make this information available,” Torres said. Nicanor Diaz, immigrant services manager at Denver Public Library, and Julie Robinson, refugee, immigrant services, and empowerment (RISE) outreach manager at Kansas City (Mo.) Public Library discussed the many creative programs that their libraries have employed to welcome refugees. Diaz discussed DPL’s Plaza Program, which offers English-conversation tables, naturalization test assistance, and arts and crafts stations at select branches. DPL also set up two-hour long training sessions on biases for all DPL staffers. Kansas City Public Library’s RISE program goes even further, offering a 12-week program to help immigrants and refugees develop the English-language skills necessary to earn citizenship and one-on-one English conversation courses that pair English-language learners with native speakers; multiple film series; and a program in which area kids wrote letters to immigrants and refugees in their native languages to help them feel welcome. The session’s most compelling testimony came from George Serwenda, a case manager at the African Community Center (ACC) in Denver. Serwenda, who hails from Burundi, was a refugee in Tanzania between 1993 and 2008. He spoke of his experiences as a refugee in the US and the important role that libraries played in his resettlement. He said the library was the first place he went to when he arrived in the US, but that’s not always the case for all. “Not many refugees know that the library is a resource,” Serwenda said. To alleviate this, libraries need to work with resettlement organizations to become a first step in the welcoming process, he said. That’s only the first step, though. Collections and staff need to be diversified to reflect the local refugee population, he said. “If there’s no single book in your own language, and if there’s no one that looks like you [at your library], that doesn’t help,” he said.